You never know when your faithful companion will show up on the cover of a magazine now do you? Is it tough living in a household where your best friend is more famous than you are? You betcha — I hope he remembers all of the little people who put him where he is now! “Wash Day” was a fun photograph concept to conceive and set up. It started out with this beautiful family heirloom copper pot that has the most amazing green patina on it. Further flea market and antique show finds completed the props. Now all I needed was a willing model. Tiki the Westie has began in training for his moment in the sun from an early age. Treats and biscuits have trained this smart dog that sitting still, looking cute and enduring the pops of light from the studio flashes is the ticket for some great cookies. This dog is so well trained that he’ll sit in his pose even if his silly master forgets something in the next room and is gone for a few minutes. Rather amazing considering I’ve had other dogs in the studio who couldn’t even manage to sit. This image and a few others with Tiki in them are the subject of a small book on Amazon called “the Quotable Westie”. 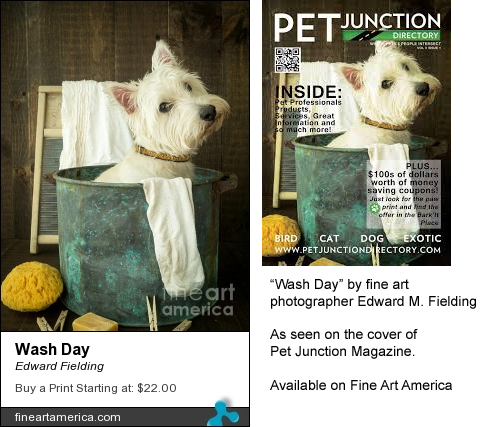 The image has proven to be very popular on Fine Art America and even ended up on the cover of Pet Junction magazine which is distributed all over Florida. What a cute and agreeable dog you have! I think the one in the clown suit is my fave, although the santa hat is a close second. Congrats on the magazine cover!